Mumps is a viral infection that is common in children between ages 5 and 15, but even adults can suffer from it. This contagious disease primarily affects the salivary glands, located at the back of each cheek in the area between the ear and jaw. The infection causes swelling of the salivary glands as well as intense pain. Other common symptoms include very high fever, headache, sore throat, sore ears, loss of appetite, fatigue, and difficulty swallowing, chewing and even talking. The virus spreads through germs transmitted from an infected person’s coughing and sneezing. There is an incubation period of between 14 and 24 days before symptoms appear, so people can spread the virus before they are even aware they have the illness. Mumps is one of those infectious diseases that runs its course and resolves naturally. While few antibiotic medications are available to treat mumps, you can try some natural home remedies to promote faster recovery and prevent complications. 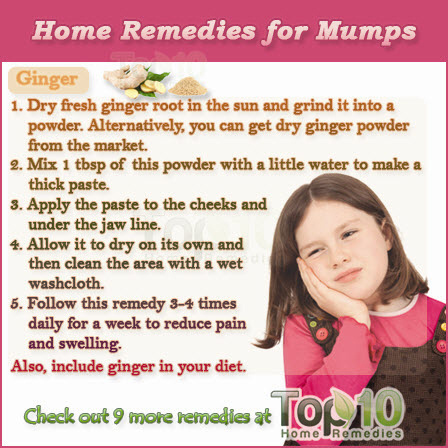 Here are the top 10 home remedies for mumps. Chebulic myrobalan, also known as Terminalia Chebula, is considered a miracle herb that can effectively treat mumps. The herb has anti-inflammatory as well as antibiotic properties that help reduce the swelling that occurs with mumps. Put one or two Chebulic myrobalan fruits in the sun for five to six hours. Grind the dried Chebulic myrobalan in a mixer with a little water to make a paste. Apply the paste externally on the areas of the throat and neck where there is swelling. Follow this remedy two or three times daily for a week to get relief from the symptoms. The leaves of sacred fig can be used to control the symptoms of mumps. The leaves contain antiviral properties that help kill the virus that causes mumps. Plus, they have anti-inflammatory properties that help reduce swelling and inflammation, two of the most common symptoms of this infectious disease. Clean one or two large sacred fig leaves and then smear them with clarified butter or oil. Warm the leaves and apply them over the affected area. Secure them in place with tape or a bandage and leave them on for at least half an hour. Do this twice daily for about a week for best results. Aloe vera is another very effective home remedy for mumps. The antibiotic, antiviral and anti-inflammatory properties of aloe vera do wonders to reduce inflammation and pain. Peel off a piece of an aloe vera leaf and extract its gel. Mix a little turmeric with the gel and then rub it over the swollen area of the throat. Leave it on for half an hour and then clean the area with a warm washcloth. Follow this simple remedy two or three times daily for at least a week. Also, drink at least two ounces of aloe vera juice daily to stimulate the immune system and speed up the healing process. Note: If you are taking diuretics or have diabetes, avoid consuming aloe vera juice as it could lower your blood sugar level. Asparagus contains many essential minerals and nutrients that can help your body fight the virus that causes mumps. For the treatment of mumps, use the seeds of the asparagus. Mix three teaspoons each of asparagus seed powder and fenugreek seed powder. Add a little water to make a thick paste. Apply the paste on the swollen area. Allow it to dry on its own and then clean the area with a wet washcloth. Follow this remedy twice daily for seven to 10 days. Ginger is an excellent home remedy for mumps due to its anti-inflammatory and antiviral properties. It will help get rid of the virus that causes this infectious disease, while also relieving the pain and swelling. Dry fresh ginger root in the sun and grind it into a powder. Alternatively, you can get dry ginger powder from the market. Mix one tablespoon of the ginger powder with a little water to make a thick paste. Apply the paste to the cheeks and under the jaw line. Follow this remedy three or four times daily for a week to reduce pain and swelling. Also, include ginger in your meals to speed up the healing process. The leaves of Indian lilac, also known as margosa or neem, can also be used to treat mumps. The leaves have antiviral properties and also are very effective in combating inflammation. Grind a handful of Indian lilac leaves with water to make a paste. Add one and one-half teaspoons of turmeric powder to the paste. Apply it on the swollen area. Leave it on for half an hour and then clean the area with a warm washcloth. Do this once daily for at least a week to relieve swelling and pain. The banyan tree, which has religious significance in Buddhism and Hinduism, is also used for treating various ailments. 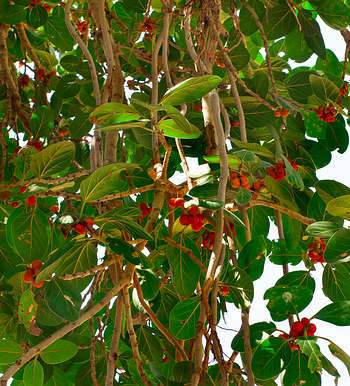 The leaves of the banyan tree are considered very effective for treating mumps. Due to the anti-inflammatory properties, they can also reduce pain and swelling and speed up recovery. Clean one large banyan leaf and dab clarified butter on it. Warm the leaf and apply the warm leaf over the inflamed area. Secure it with a bandage or tape. Leave it on for a couple of hours, or overnight for best results. Follow this remedy twice daily for about a week. Extracts from the mullein leaf have antiviral as well as anti-inflammatory properties, making it an ideal treatment for mumps. Also, the cooling, soothing properties of mullein help reduce inflammation and enhance healing. Add one tablespoon of dried mullein leaves to the steeping ball. Place it in a cup and pour boiling water into the cup. 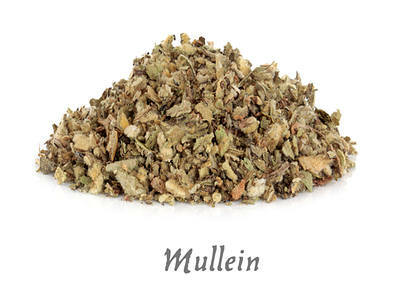 Allow it to steep for about 10 minutes so that the properties of the mullein are released. Soak a clean cloth in the mullein tea and place it over the swollen area for a few minutes. Repeat several times a day for a week. You can also drink one to two cups of mullein tea daily to speed up the healing process. Baking soda has strong anti-inflammatory properties that help reduce swelling associated with mumps. 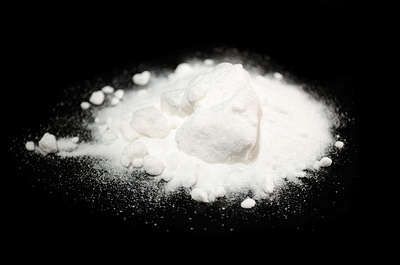 Also, the alkaline properties of baking soda help restrict the growth of the virus that causes mumps. Mix a pinch of baking soda and a little water to make a smooth paste. Apply the paste on the area where there is swelling. Leave it on for two minutes and then wash it off with lukewarm water. Do this two or three times daily for a week. 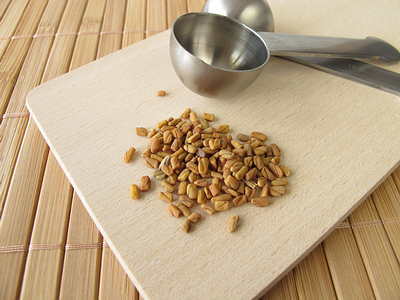 Fenugreek seeds can also be used to treat mumps as they have strong anti-inflammatory and antiviral properties. Grind one teaspoon of fenugreek seeds into a fine powder and add a little warm water to make a paste. Apply the paste on the affected area. Leave it on for about half an hour and then clean the area with a wet washcloth. Do this two times daily for a week. Alternatively, you can add one tablespoon of fenugreek seeds to a glass of lukewarm water and drink it twice daily. These remedies will bring much relief from the swelling and pain caused by mumps and will help you recover faster. Remember, mumps is a contagious disease, so it is important to stay in bed and avoid contact with others to prevent spreading the disease. Asparagus and Fenugreek make one of the best home remedies for Mumps.